Smoked perspex design, fire resistant, hydrocarbons resistant. We offer a full range of acoustic hoods for just about any environment. 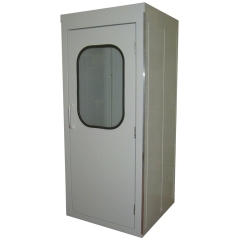 Our acoustic hoods can be found on oil platforms, in hotels, hospitals, prisons, power plant, etc. 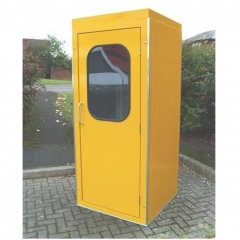 You may also want to have a look at our heavy duty telephones as they are ideal for use in public areas or where environmental conditions require a very tough telephone. As standard, a telephone mounting panel is fitted to the inner back panel of the kiosk. 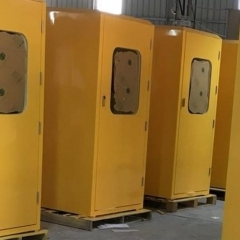 Supplied fully assembled, the kiosk can be made available for future dismantling making it possible to install where the fully assembled kiosk cannot fit, through a doorway for example. 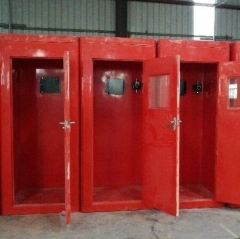 Often used on off shore oil rigs where a little privacy and quiet is often hard to find. 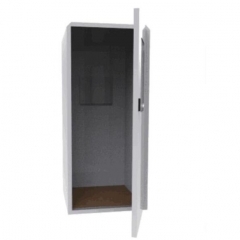 Manufactured in glass reinforced plastic, the outward opening door has a polycarbonate glazed panel, is fitted with an automatic door closer and has a robust handle. A sloped roof prevents collection of moisture and rainwater. Internally the three sides of the kiosk are pre-lined with 50mm non-combustible, non-hygroscopic acoustic insulation (density 60kg per cubic metre). This is held in place by galvanised perforated panels. An acoustic slab is place inside the roof cavity for further insulation. Optional extras are internal lighting, carpeting and a translucent roof which allows a natural light source. A double glazed window unit can also be fitted to the door upon request. Postage – Please choose the postage “Acoustic Hood – (Grey and Yellow Marine, GRP Kiosk)” option at the checkout. This product is supplied on a pallet and is very heavy. Overseas shipments, Please contact for shipping rates. Feel free to contact us for more information about volume orders and localised shipping rates.